Not every personal injury lawsuit goes to trial. In fact, it is often less expensive and less time-consuming for litigants if their claims are resolved outside of the courtroom (but sometimes a trial is still your best option). 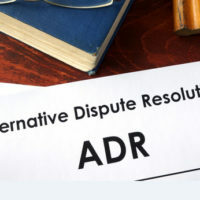 There are two main forms of alternative dispute resolution (a method other than litigation used to resolve a legal dispute between two or more parties) in Florida: mediation and arbitration. Courts often require mediation so that the parties can discuss their dispute and potentially come to a resolution in a nonadversarial setting. A mediator helps guide this discussion but doesn’t force anything. If the parties reach an agreement that keeps them out of litigation, then great! But nothing in the mediation process itself is binding. Arbitration is similar to a trial, but it doesn’t involve a jury and is faster, cheaper and less adversarial than a trial. Under Florida law, arbitration “means a process whereby a neutral third person or panel, called an arbitrator or arbitration panel, considers the facts and arguments presented by the parties and renders a decision.” If a court affirms this decision then it is legally binding on both parties. There are several types of arbitration, including mandatory arbitration, voluntary arbitration, binding arbitration and nonbinding arbitration. In some cases a court, law or contract term may require the parties to go through arbitration. The parties may also decide on their own that arbitration is a good option. When an arbitrator’s decision is binding, that means the parties must accept it as the final decision. When an arbitrator’s decision is nonbinding then the parties may choose whether or not to accept it as final. If either side does not accept the decision then the case may proceed to trial. The best way to resolve your personal injury claim depends on the facts of your case. An experienced attorney will help you decide whether to request mediation or arbitration or to proceed directly to trial (if possible). There are many factors to consider, including the evidence that has been collected by either side, the time and expense involved, and the strength of your claims. An effective personal injury attorney will help you determine the best strategy for YOU — and not for the attorney’s own personal gain. If you have sustained a personal injury because of someone’s negligence, contact a West Palm Beach personal injury attorney at The Pendas Law Firm today for a free consultation. We will walk you through your legal options and help you determine your best course of action. The Pendas Law Firm also represents clients in the Miami, Fort Lauderdale, Fort Myers, Jacksonville, Tampa, Orlando, Daytona and Bradenton areas.